There’s nothing quite like the smell of fresh baked cookies or homemade pumpkin bread hot out of the oven. Baking is a longstanding tradition in many families. Recipes are passed on from generation to generation and regarded with a sense of family pride. But just because you’re using your grandma’s famous secret 40-year-old snickerdoodle recipe doesn’t mean you can’t use modern baking accessories to make the end product golden-brown and delicious. With the help of silicone baking mats, you’ll find it’s simpler to bake your favorite treats and easier to have them come out as perfect as your grandmother’s (or perhaps even better!). With so many options for non-stick solutions, why choose silicone mats for your baking needs? To put it simply, they’re better than the other options. Here are a couple of the most popular non-stick alternatives and how they match up to their silicone competitors. Parchment paper can rip or tear. There’s a reason wax isn’t one of the ingredients in any of the cake recipe you’ve seen – it’s not supposed to be there. Unfortunately, if you’ve used parchment paper to bake anything from a roast to a pan of brownies, you’ve probably noticed parchment paper’s inclination to tear, leaving bits of wax behind, but there’s no room in your culinary masterpiece for bits and scraps of paper. With silicone, there’s not even a sliver of a chance of that happening. Next, there’s the option of aluminum foil. It’s less inclined to rip, but more likely to burn your baked goods to a sad little crisp. Because foil conducts heat exponentially more than any other option, it causes uneven heat distribution. If you’ve had a cookie turn black to a crisp on the outside while the inside is still a gooey mess, it might be your foil’s fault. Silicone, on the other hand, conducts heat in a balanced manner. They help make sure your baked goods cook evenly and don’t scorch. Lastly, there are baking sprays. Unfortunately, these have highly negative nutritional properties. Furthermore, when exposed to heat, many of them emit carcinogens that have been linked to the onset of cancer. A key ingredient in most non-stick aerosol sprays is dimethylpolysiloxane, which is a liquid form of silicone. Inevitably, when applied to a nonstick surface, some of the formula soaks into the food, but you probably don’t want to consume liquid silicone any more than you’d like to go outside and graze on fake grass (even if it is from this list of best artificial grass mats). The bottom line is that you probably aren’t keen to consume any plastics or silicone in your rump roast or banana bread. Thankfully, silicone mats are safe, even when heated to high temperatures. They never impact the taste of your product and have zero implications for the nutritional composition of the food that bakes on it. Of the single-use options and other non-stick alternatives, silicone baking mats are the clear winner for healthy, easy, cost-effective baking. If you don’t want to eat bits of paper, burn your baked goods, alter the taste of your product, or expose yourself to harmful toxins, then silicone baking mats might be the way to go. They won’t tear, burn, or torture your taste buds and stomach. Silicon mats are a universal kitchen accessory that’s changed how bakers bake. Over recent years, they’ve become the ideal companion for commercial bakeries, as well as a trusted staple in home kitchens. Here are some of the many reasons that make silicone baking mats the go-to choice for all kinds of bakers. When your options are to continually purchase items like parchment paper and aluminum foil or to make one single purchase and never worry about it again, it becomes clear which option is the most cost-effective. Silicone baking mats are already pretty affordable, so it’s easy to see why many opt to purchase them instead of continually buying single-use products year after year. Instead of frequently purchasing disposable alternatives like aluminum foil and parchment paper, a good silicone baking mat can last years on end. Besides being friendly for your pocketbook, silicone mats are also better for the environment. Rather than create unnecessary waste through the use of single-use items, you can purchase one silicone mat to last for years. Especially when it comes to materials like aluminum foil which take forever to decompose in a landfill, silicone is the gentler option when it comes to considering the environment. Silicone mats are easy to clean and usually dishwasher safe. They can usually withstand extremely high temperatures, so you never have to worry about if you’re burning or melting it. Lastly, they’re usually both freezer and microwave safe, making them versatile and efficient additions to your kitchen accessory collection. Do your baked goods continually come out a blackened hunk that not even the dog will eat? If your pooch would rather gnaw on the floor tiles than take your baking scraps, it might be time to invest in a silicone baking mat (and maybe some safe and durable dog flooring, too). On top of simplifying the baking process and saving you money, silicone mats massively improve heat distribution. While some other alternatives may over-direct heat into certain areas causing burns, silicone baking mats make for an evenly-baked product. It’s the best way to ensure your cookies come out deliciously golden brown, fresh-kissed by the oven and not burnt at the tips and uncooked in the middle. Silicone is a flexible material that bends easy. Unlike the storage boxes for products like parchment paper and aluminum foil, a silicone baking mat can be rolled up or stored flat. When stored flat, it takes up virtually no space. Just be sure that you’re not creasing, bending, or folding it, as this causes damage. Additionally, store your mat away from sharp or hard objects to prevent it from getting minor cuts and damages. Though silicone mats are flexible and durable, they aren’t like chair glass mats which are built specifically not to dent or bend when under extreme pressure. Along with being able to endure high temperatures, the flexible properties of silicone also make these baking mats hard to break and damage. Aside from possible discoloration and staining, a high-quality silicone mat that’s been well cared for can look and operate just like new for many years. When selecting a silicone mat, you want to go with the highest grade product. This helps avoid the presence of parabens and other harmful ingredients that lesser, cheaper mats may permit. The presence of parabens is especially harmful when the mat is heated over long periods of time. This allows harmful toxins to transfer from the mat to your food, posing serious dangers to your health. Always look for silicone products that are PFOA free and phthalate free. Check that the item’s materials have passed FDA tests for quality, and are safe to be used with food. Sure, you may not be ingesting the mat itself, but an item that comes in contact with your food needs to be free of any harmful ingredients, so as to avoid illness. In short, when it comes to silicone mats, quality matters. Be sure to check labels, and be willing to spring for a slightly more expensive product if it means purchasing a mat that’s safer for yourself and your family. Though there’s a lot of similarity between silicone mats on the market, the three defining features that set one mat apart from the other are texture, mark, and color. Here’s the down-low on what the differences are, and what and of baker each might appeal to. While there are entirely smooth baking mats on the market, most mats are at least slightly textured. Usually, in the format of a woven pattern, textured mats aren’t just for looks – the small grooves can further help from burning by helping to distribute heat and allowing for airflow. These mats might be especially helpful to those prone to burning their goods. Some mats contain measurement markings as an optional feature. You might select a marked mat if you’re invested in making cookies or other baked goods that are uniform and exactly the same size. Put simply, marked mats take the guesswork out of portioning cookies on the pan. Though some home bakers are perfectionists and may opt for this, it’s mostly something that professional bakeries are concerned with. If you purchase a pack of several silicone mats, you might think about going with a color-coded set. Though the appearance of the baking mat doesn’t impact its functionality, colored mats can be especially helpful for those who bake a wide variety of food types. Color-coded mats help make sure that you’re not using a mat you used to bake a roast to make cookies, an vice versa. Now that you know the various types of mats, their features, and who they appeal to, here’s a couple things to consider before making your purchase. To choose which size of a mat to buy, consider which baking pans you most frequently use. You’ll want to get one that can fit as snug as possible into your pan or onto your cookie sheet without curling up or exceeding the lip. A few mats out on the market are designed specifically to be cut and customized to perfectly fit your baking sheets. However, any mat with a woven pattern containing fiberglass should never be cut, as bits of fiberglass can fuze into your baked goods. If you have several drastically different sized pants you frequently bake with, you might consider purchasing a couple mats specifically fitted for each one. Silicone mats range vastly in price. Keep in mind that if stored and cleaned properly, a new mat is going to potentially last you years, so it makes sense to invest in a quality product and pay the extra bucks for something that’s going to work well for a long time. Additionally, be wary of ultra-affordable mats. Though they may have a comparable look and feel to their higher-priced competitors, they might contain PFOA, BPA or other harmful toxins. The use of silicone baking mats is pretty straight forward. They’re simply placed at the bottom of the pan, just like you’d place parchment paper, aluminum foil, or any other non-stick solution. However, there are a couple tips and tricks to using silicone mats and ensuring that they meet their full potential. While silicone mats are durable and flexible, they can’t take the abuse of other mats like the professional playground mats used at your child’s preschool or the professional stall mats for horses. Be careful and take care of your baking mat and it will take care of your baking needs. Never cut anything on it – cutting boards exist for that! Even if you’re being careful and trying not to sever the silicone, even the slightest cuts can open up the mat to start slowly falling apart. Furthermore, small incisions caused by cutting baked goods on it are a health hazard. These small wounds can collect bacteria from baking that’s hard to clean out. The last thing you want is to contaminate your fresh cookies with dangerous bacteria. Unless your mat intentionally specifies that it’s intended to be cut to size, never attempt to alter its size by cutting it. 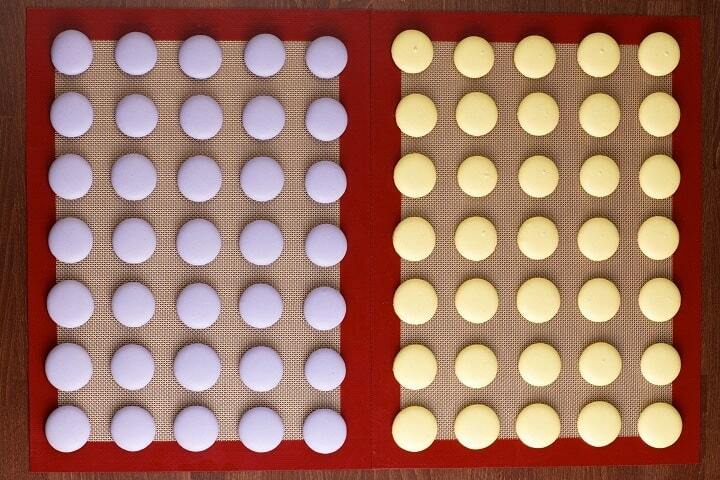 Like the bamboo mats traditionally used in tatami rooms, cutting the average baking mat will completely destroy it. Most mats are constructed out of woven fiberglass, and cutting edges causes the mat to unweave, allowing bits of fiberglass and other mat particles to break free and potentially lodge themselves in your food. It’s always smart to check the label or packaging when you purchase any product, but many silicone baking mats are dishwasher safe and can simply be run through the machine when cleaned. If you prefer to wash by hand (or don’t have a dishwasher) the process is pretty easy. Simply wash the mat in some warm, soapy water with a soft sponge. Then, dry it with a clean towel before putting it away. In short, the process is pretty much the same for washing baking mats as it is with most other dishware and kitchen pans. Do you struggle to strive for that perfect, golden-brown color when baking chocolate chip cookies? Do your brownies consistently come out burnt on the outside, but underdone in the middle? Are you sick of the waste and hassle created by single-use products like parchment paper, foil, and non-stick sprays? If you’ve nodded your head to any of these questions, it’s probably time to invest in a silicone baking mat. They’re affordable, easy to use, and simple to clean. Plus, you’ll never burn a tray of your grandma’s famous cookie recipe ever again.